So you want to go to India and experience its people, right? Are you looking for an authentic experience? Or maybe you are just looking for cheap transport in India… you may have landed here because you are a penny-pinching backpacker. Someone willing to beg for rotten vegetables from street sellers, prepared to disembowel a holy cow and sleep inside of its belly to fight the Himalayas’ freezing cold, sorta Leonardo di Caprio in “the Revenant”? That’s sick, dude. Really sick 😀 — (Well, if you ever come to Penang where we live, we have a great backpackers guide for that). No matter your traveling style, the sleeper train in India is an experience you’ll never forget — akin to sailing on a PELNI boat in Indonesia. We have used second class sleeper to travel all over India by train, from Amritsar in the far West to Dibrugarh in the upper Northeast; from Kerala to Mumbai, Gujarat, and Rajasthan. And even when we traveld to North India’s best hill stations, we always took the train as far as we could. Trust us: you won’t make more interesting random encounters anywhere than on an Indian train’s sleeper seat. 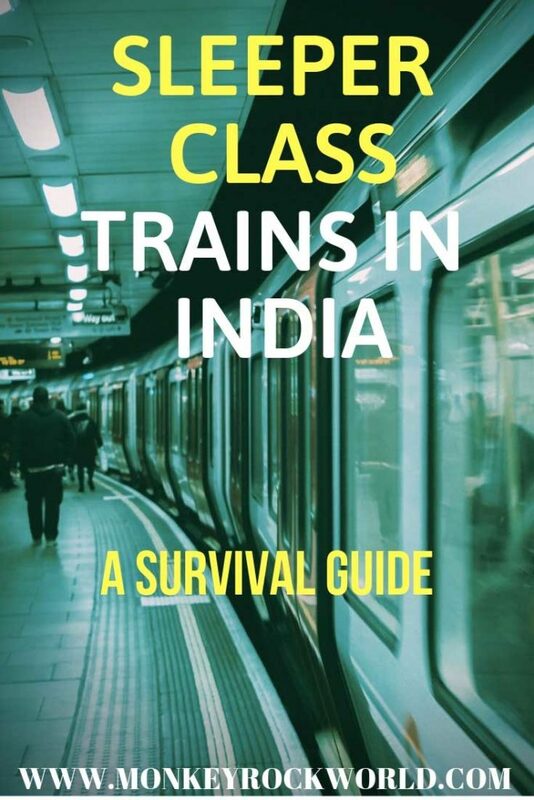 After so many trips — and even more delays — on the Indian Railways we have definitely learned a few tips to survive — and even enjoy — India’s sleeper class. 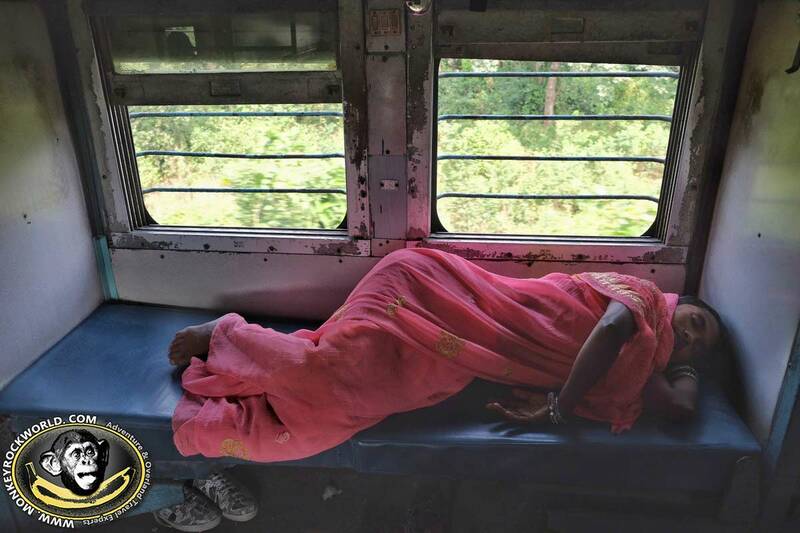 We are going to share some good tips in this funny photo essay we shot in November-December 2018 as we traveled on second class sleeper across the Indian states of Uttar Pradesh, Bihar, and West Bengal. First of all: What is a Sleeper train in India? As the name implies, a sleeper train in India is made, well… for sleeping as you travel long distances (picture credit: Kit Yeng Chan). To start with, let us tell you what is a second class sleeper. India has quite a convoluted train system, and with a billion plus humans, it’s even harder to buy tickets. We will not explain how to buy train tickets in India here. Just consider that each Indian train has four classes of carriages. The second class sleeper is the second to last, just above the rock bottom general class — meaning everyone can get in, there’s no seat reservation, just an elbow-in-the-eye, stay-on-the-luggage-rack kind of a mess. 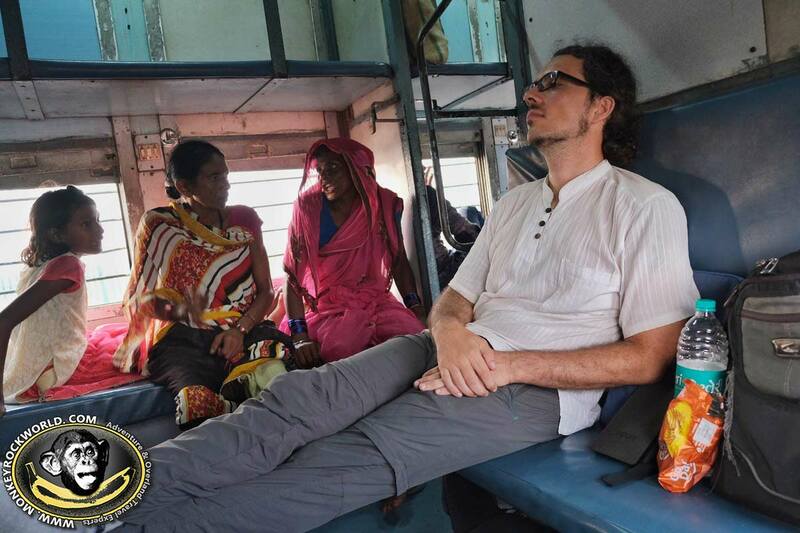 Marco chilling in the lower bunk while two women chat in the sleeper class train’s lower side bunk (picture credit: Kit Yeng Chan). 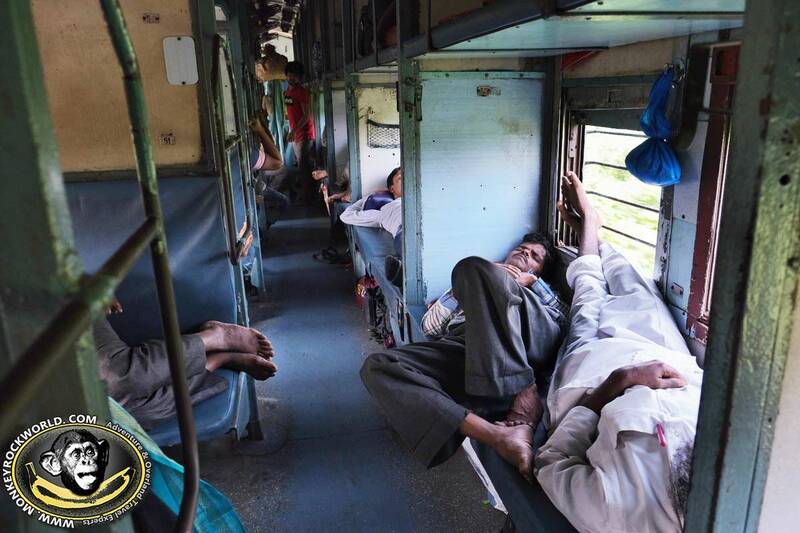 Sleeper class in India is a carriage with open compartments with foldable bunks, six on one side of the train — two opposite tiers of three beds each — and two on the left side, positioned one right above and one right below the window. The middle berths can be folded up and down. It’s like the 3rd class on a Trans-Siberian train, but with much more scruff around the edges. During the day people seat on the lower berth, while the middle berth is folded down and functions as backrest. Middle train sleeper seats are usually rolled up to sleep by 9 pm. So if your idea of a peaceful trip is to get some privacy (ahahahahah) make sure you book an upper berth or one of the two side berths. 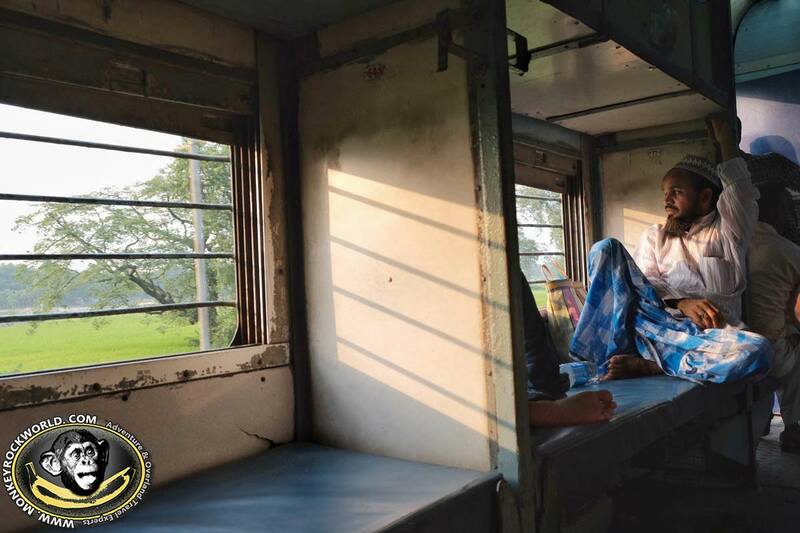 In a sleeper train in India, the lower berth is used as a seat in daytime hours. This doesn’t mean people won’t lay down to sleep (picture credit: Kit Yeng Chan). First of all, sit and relax: it’s going to be a long ride, for Indian trains are always delayed. PRO TIP – You can use applications like Ixigo to track the running live status of your sleeper train. This is especially useful before you go to the station. Check if your train is delayed and avoid pitiful waits — or camping out — on the platform. It’s best to store it underneath the lower berth, even if it’s not your allocated seat. The berths have metallic rings to lock the luggage, a good thing to do on overnight trips on the sleeper train in India. Bring a chain and padlock from home, and don’t leave valuables, money, electronics and anything sensible in your bag while you sleep in an upper berth. 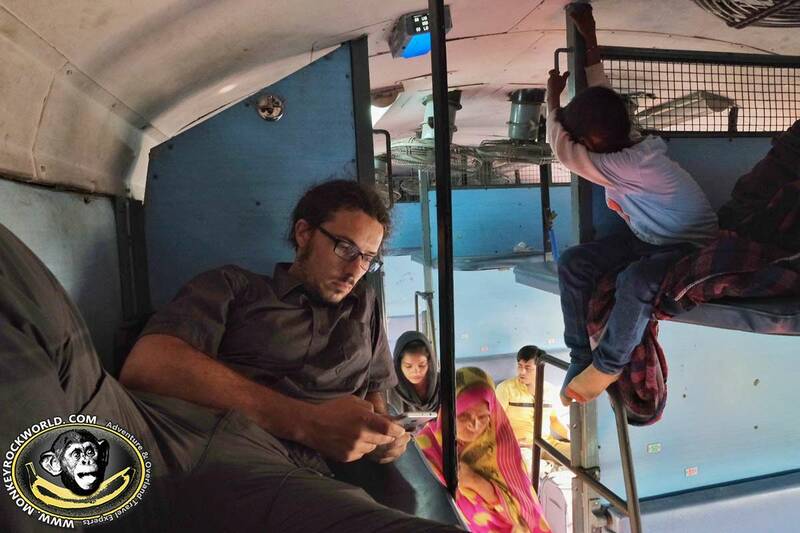 We always carry a smaller backpack to store our cameras and laptops and we stash it between our heads and pillows — which you must bring yourself, as in sleeper class in India you get nothing but stares. As we just said, you’ll get nothing but a bare bunk lucid with dirt. A sleeping liner is mandatory, and you better carry a real sleeping bag if traveling in India between November and February, especially in the North, as nights get very cold, and the sleeper train’s seats are not air-conditioned. The windows never close properly, so if you want to avoid getting cold and sick, prepare as if you were going to camp outside. There’s really not much difference. Most compartments have one electric plug. If it’s working, you must share with your neighbors. There are usually also a few more electric plugs positioned near the train carriage’s doors, just before the toilets. If you decide to leave your phone charging there, you better stick around (read: stand close by) or sit somewhere you can always keep your eyes on it. 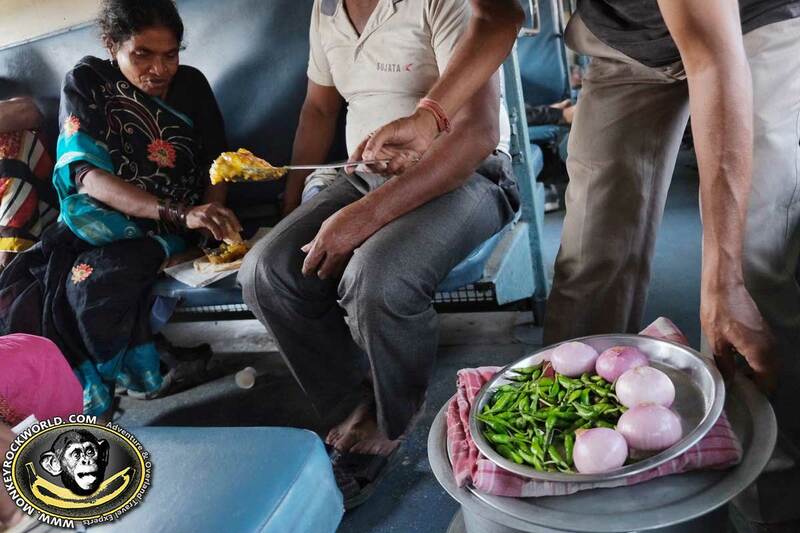 Lunch is served on an Indian sleeper class train (picture credit: Kit Yeng Chan). At times it seems like there are more sellers than passengers on Indian sleeper class trains. Carrying baskets filled with provisions, they rock up and down the train, getting up and down at different stations, and feeding the masses of budget travelers. 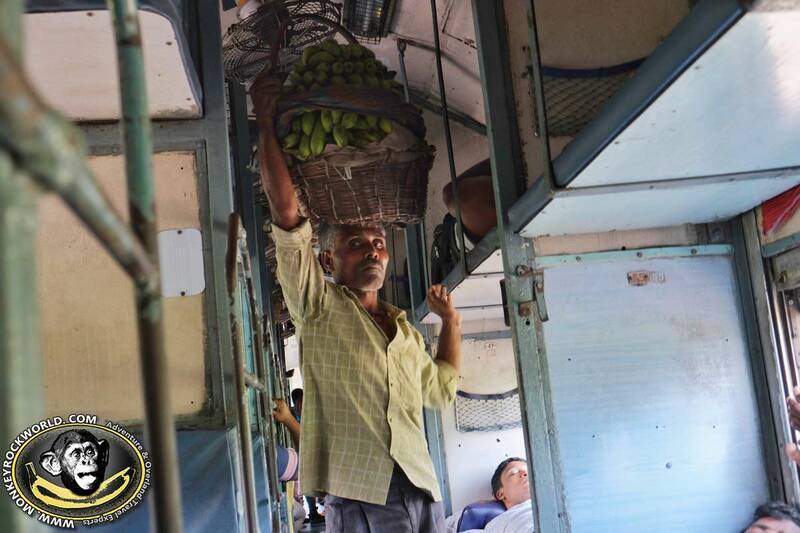 Oh Oh Oh… bananas are coming – a seller walks in the aisle of an Indian second class sleeper trying to make a living (picture credit: Kit Yeng Chan). We have eaten on the train only a couple times, for every trip to India gives us at least one type of stomach bug, and we now tend to be extremely careful with food. But you should try at least once, especially if the food is packed and warm, as you can get some very nice biriyanis. 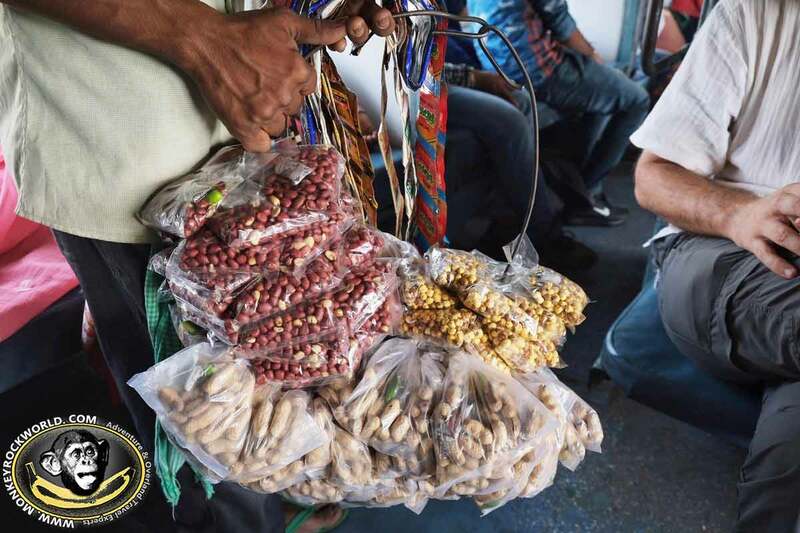 We’d steer away from the nuts-and-chickpeas variety of snack that’s plentiful on second class sleeper: it’s prepared in front of you, yes, but comes from who-knows-where, and sellers shuttle it around all day in the sleeper train, soaking up dust and dirt. Bleargh. Do you really want to eat this stuff on a sleeper train in India? (picture credit: Kit Yeng Chan). What you can drink liters of, instead, is chai. In India, chai simply means “black tea”, but on sleeper class, you are generally served the much tastier milk tea variety. We love chai so much we don’t really care where it comes from, and at INR10, we buy a lot to sweeten those long train journeys. You can have a simple breakfast buying cookies and snacks at train stations’ platforms before boarding your train. Yes, we mean it. 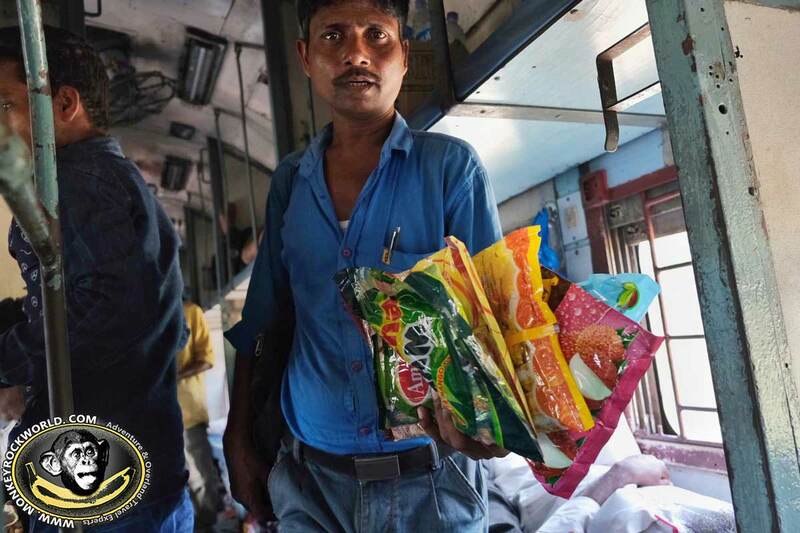 Or buy them from this guy, or any of the dozens food peddlers you’ll meet on India’s sleeper class trains (picture credit: Kit Yeng Chan). As anything in India, the amazing local encounters one can do on a sleeper train in India also include a bunch of unsavory types. Just keep your cool, enjoy the ride, and learn how to deal with them. When you are deep into your book, and you hear a sound of clapping hands, two times, inches from your face, there you go: here come the ladyboys. CLAP CLAP! Indians believe that ladyboys are somehow invested by magical powers, and as such, they can give you the evil eye. That’s how ladyboys dressed in colorful sarees jump on the sleeper trains in India, asking for money. Young men traveling by themselves are their favorite target. When people don’t pay, the ladyboys will curse them using what Indian friends described as “very foul language”. It also happened to us: just keep reading your book or do whatever you were doing. Ladyboys are annoying but generally harmless. Older men or fathers in families are quite good in sending them off with those sweet, firm words you won’t ever care learning. Indian Railways have attendants in uniform who, sometimes, come to sweep the carriage clean of all the rubbish Indian passengers dispose above and below the train’s sleeper seat. They won’t ever ask for money. But if you see young men squatting on the floor, cleaning the train with a rag, trying to be overzealous and coming under your legs to do the best job possible, there you go. At the end of their round, they’ll come back asking for their pay, sometimes pretty insistently, too. It’s up to you to pay or not, but remember, nobody asked those guys to clean in the first place. When beggars get annoying, this is the best strategy to learn when riding any second class sleeper in India (picture credit: Kit Yeng Chan). India is infamous for its syndicates of beggars who get by (sometimes handsomely well) by showing their crippled limbs left and right. We obviously pity and respect their problem, but we can’t condone begging, in any form, anywhere. What we call “yoga masters” are found in big numbers on sleeper trains in India. We’ve seen people with their right legs unnaturally bent all the way up, knee over the shoulder, passing a bowl around and begging. Again, ignore them. You’d be doing more harm than good by giving them anything. These people need help in other forms. Don’t feed their syndicates and keep them on the streets. Similar to the category above, these little kids have been trained by unscrupulous adults to hop through plastic circles, do backflips and other stunts directly between your knees and the opposite lower berth. They are the acrobats of India’s second class sleeper circus. We think they should better quit the sideshow and go back to study in school, so please don’t give them any money. That’s their parents’ excuse to send them out begging on the train rather than keeping them in school to get a real education. Life along the rails in small-town India (picture credit: Kit Yeng Chan). Please understand that toilets in any sleeper train in India are poorly maintained, to say the least. Passengers seem to defy gravity with their dejections, at times doing it where you should stand. On a recent sleeper class ride from Patna to New Jalpaiguri, some artist left a turd the size of a mid-size Domino pizza under the sink, 30cm away from the toilet hole. Creative, isn’t it? Regardless of such foreign objects, we have seen people walking barefoot in inch-thick puddles of water and excrements, all made the worst by cleaners who just hose the whole cubicle down without clearing the feces, and not giving a damn. Our suggestion here is only one: use common sense. Try to go for the western toilet — each sleeper train in India has one of each variety in every carriage — because locals prefer the Indian toilet. Don’t even think of going in without wearing shoes or slippers. Try to go at the beginning of the trip, or right after the train has stopped stopped at a major station, when toilets should be cleaned by ground staff. 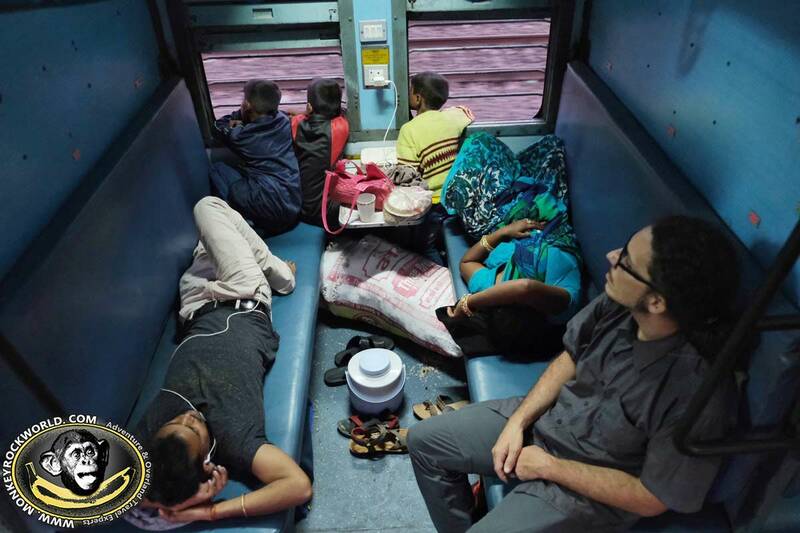 On India’s sleeper trains, every inch of space literally counts (picture credit: Kit Yeng Chan). You’ll soon realize that the more you cling to your berth, the best it is. If you are afraid of sharing with the locals, an upper berth, which grants a bare minimum of privacy for the best part of the day, is the way to go. Otherwise, try to forget about etiquette, and just claim your space, because people will do the same. 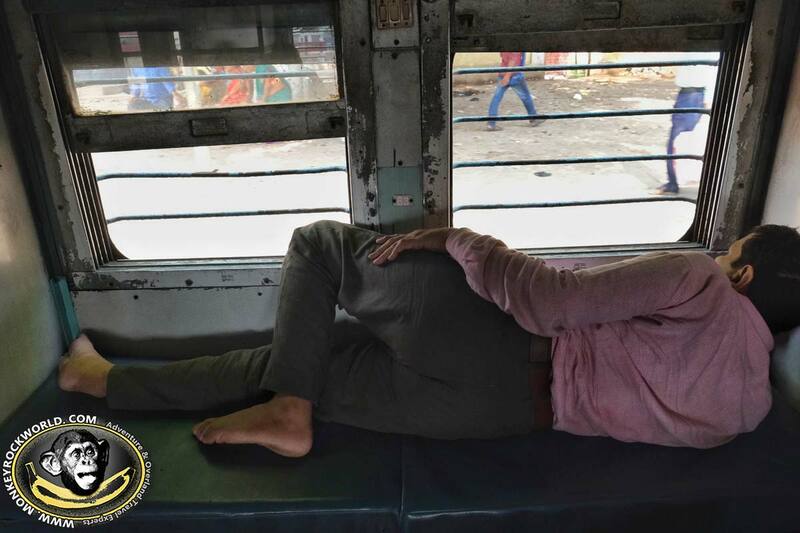 With the worsening condition of sleeper trains in India, there’s also far less control and many people who only hold general class tickets will jump on your carriage at smaller stations, sitting wherever they find a space. Even if you lay down on your berth, it won’t be uncommon to have children or small women — Indian women tend to be of the lighter, smaller type — come to sit between your toes and the 10 centimeters gap between your feet and the wall. Just take a deep breath, think of Lord Shiva, and don’t move. Let them be. They are experts in the art of contortion, and they’ll adapt to any space you give them. And don’t be afraid to tell those rascals who jump on your berth that they have taken your seat, and to get the hell out. It may take five times and countless head-bobbling, but in the end, they will go if you stand your ground. Most of the photos you can see in this article were taken with a Fujifilm XT3 using a kit lens 18–55mm. You have to exploit the available light, so seating close to one of the windows, or asking your fellow passengers to open one, is the way to go. Try to seat on the edge of the lower bunk, as it’s a very good vantage point to use a wide lens and capture good low angles of passing sellers laden with colorful goods, and passengers sleeping in funny positions. 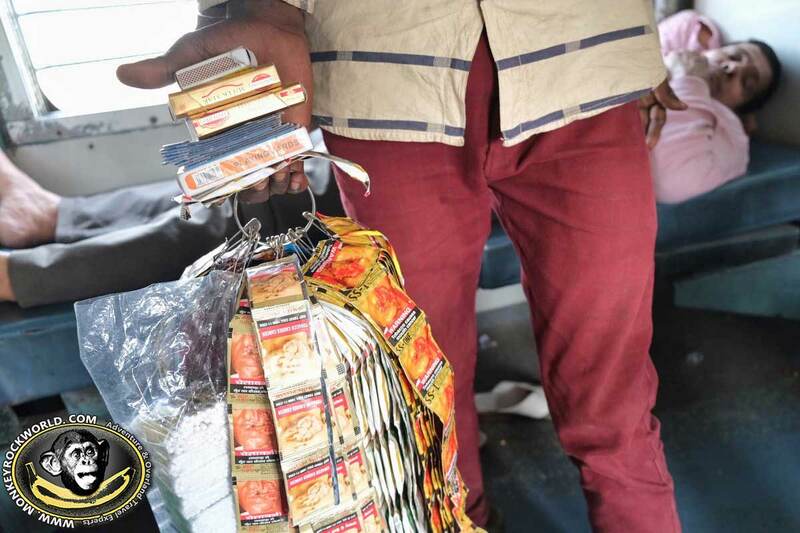 Pan, matches and local cigars, right from the edge of the lower berth on India’s sleeper class (picture credit: Kit Yeng Chan). 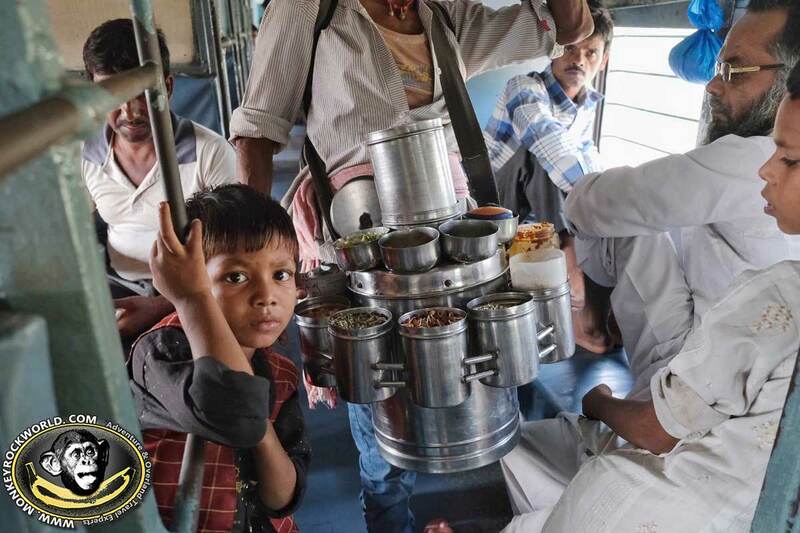 Nuts are the only thing besides chai we’d eat while riding a sleeper train in India (picture credit: Kit Yeng Chan). Lower berths are great to snap photos from wide, low angles (picture credit: Kit Yeng Chan). The upper side berth is also a great vantage point to shoot top to bottom, giving you and your lens a wider, deeper sense of the field and a better perspective to picture sleeping people. 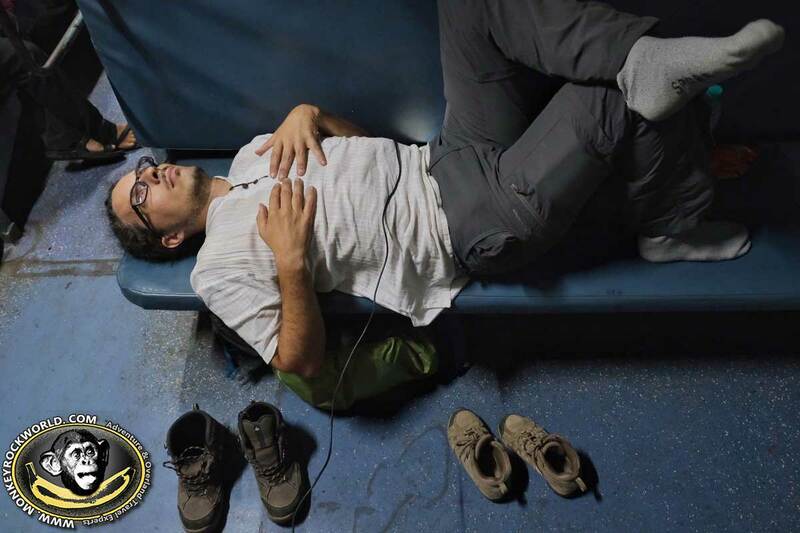 Marco top to bottom, crushed on the lower berth at the 10th hour of a delayed sleeper train ride from Patna to New Jalpaiguri (picture credit: Kit Yeng Chan). Usually, on sleeper trains in India, we don’t ask permission to take portraits — this is to get the most candid shots, as we noticed that if you ask to take their picture, Indians say yes all the time, but then pose very unnaturaly. After you get your portrait, it’s nice to show it to them, as this usually breaks the ice and brings up good conversations. Last tip: avoid taking pictures of beggars, ladyboys and other unsavory types described above. You may think it’s a great idea for a wild shot, but in the end, you’ll have to pay them money, and maybe you’ll even get in trouble. LIKED THIS GUIDE? PIN IT ON YOUR PINTEREST BOARDS!!! YES SIR, I WANT THE GOODIES.